Do you experience challenges with the process of window cleaning around your house? Your struggles are not enough to wipe stains, water streaks and dust build-ups from glass surfaces? The professionals of window cleaning in Notting Hill will help you out! Say bye-bye to the innumerable hours of polishing and wiping – the skilled and experienced team members will deal with this problem. You will be able to enjoy your free time – just let us do this slow and exhausting work for you. Our professional approach will grant you lots of perks. We also provide our professional services in nearby areas: White City, Bedford Park, Shepherds Bush, Holland Park, Bayswater. You will have perfectly looking workplace with the help of the experts of commercial window cleaning. You can depend on our first-rate services for all kinds of business premises. If you own a small shop, we can carefully clean its windows by using water fed extension pole tools – it helps us to as high as the fourth floor. If you require flawless look for the glass panes of a skyscraper in London and the neighbouring areas, we will make use of our rope access tools. In any case, you will enjoy superb results in no time. You can always rely on our workmanship and commitment for domestic and commercial window cleaning. Our experience allows us to clean all varieties of windows you could possibly have at your property. For instance, you can apply for cleaning of small or double windows, sash ones, French doors, patio doors and bay windows. Besides that, we include greenhouses and skylights as part of our routine. So to speak, you can enjoy the good look of your windows with our swift and reliable services. We use the most exceptional techniques to be sure that you get second-to-none window cleaning. With our water-fed extension pole cleaning system and jet washing technique, you will enjoy spotless look of your windows. We connect our poles to water reservoirs in our vans to ensure that there is no danger for the exterior of your home or business building. For higher windows, we utilise absolutely secured rope access approach. You can benefit from these cleaning methods now – just ring 020 3746 3113! 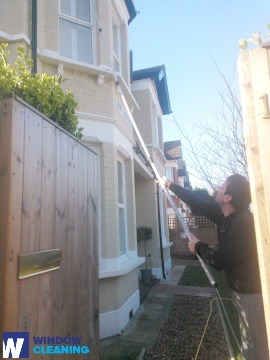 The specialists of window cleaning in Notting Hill will make you feel proud of your home. We offer excellent window cleaning services in Notting Hill. Our routine includes water fed extension pole system and also high-pressure cleaning. We protect your health and safety with non-toxic solvents and purified water. Join our satisfied customers – dial 020 3746 3113 and contact our customer care. You can also request our services online – just fill in our booking form or use our chat option. The nearest tube station serving W11 Notting Hill is Latimer Road.